If you want to cut back on carbs but don't want to eliminate bread, how do you choose lower-carb bread? On a truly low-carb diet for your health, regular bread has to be very restricted. 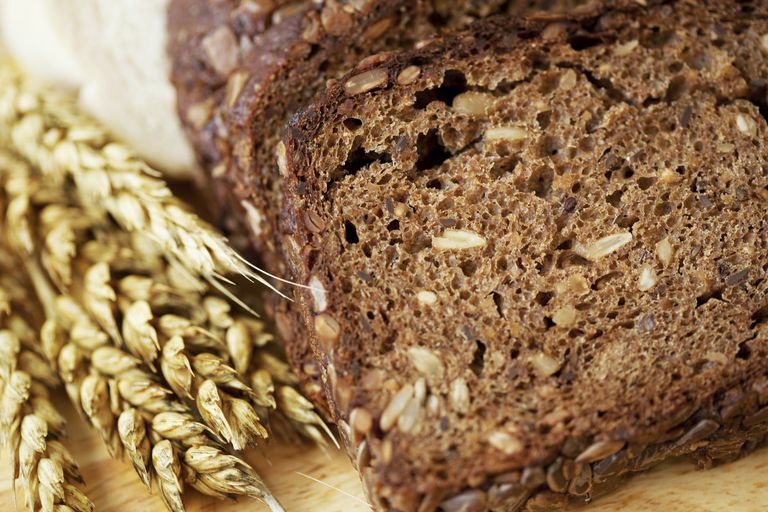 You must switch to special low-carb bread or make your own, such as flax meal bread. Grains like refined wheat flour are mostly starch, which is made up of long strings of glucose. The enzymes in your saliva start breaking down starch molecules into sugars as you chew. By the time they reach the stomach, most starches have been converted to sugar. But there are exceptions, which are what you'll want to pay attention to when buying bread. Some types of bread, like sourdough, may have less of an effect on your blood sugar. "Light" or "lite" bread is a marketing term used to describe bread that is usually lower in carbs and calories than a brand's regular version. The reduction in calories is usually achieved by adding more air when the bread is being made, making the slices smaller. In some cases, starch from the original recipe is replaced with fiber. Bread labeled "low-carb" can also have added sugar and may have very little nutritional value, so you'll want to read the nutrition label and ingredient list carefully. Here's an example of the difference between one brand's regular and light bread. Several other brands have light bread options. Most include a reduced calorie and carb version of classic whole wheat, but some brands (like Healthy Life Bread) offer other flavors and styles, including hot dog buns. Some brands offer sugar-free and gluten-free bread options as well. Perhaps the best commercial bread substitute is a low-carb tortilla. They are reasonably priced, and many grocery stores carry them. Make a healthy wrap, use it as a hot dog bun, or as the basis for a low-carb pizza. If your local store doesn't carry them, several brands can be purchased from online sellers. When you know what to look for, it's easy to shop for low-carb bread at your local supermarket, health food store, bakery, and even online. Check the nutrition label. To find usable carbohydrate, subtract the fiber from the total carbohydrate. This is the most important step when figuring out a food's effect on blood glucose (how glycemic it is). If you are counting carbs, you'll be used to checking a food's carbohydrate content. Even if you don't specifically count carbs, you will want to compare carbs in several loaves of bread from different brands to find the option that fits your diet best. Smaller or thinly-sliced bread will have less carbohydrate and calories simply because they have less mass. However, watch out for very dense thin bread, as the amount of starch in this bread can be similar to regular bread. Brands may substitute fiber for some of the starch in their bread, reducing calories as well as carbohydrate. However, more fiber doesn't necessarily mean a smaller impact on blood sugar. The effect won't be achieved if the fiber is simply added to the other ingredients, rather than being a substitute for the starch. The more finely ground a kernel of wheat or other grain is, the more quickly the starch will break down into sugar. There has been an effort by some bread manufacturers to make 100% whole grain bread softer with a texture more like white bread. The problem is, this bread is generally every bit as glycemic as white bread. More roughly-textured bread will generally be less glycemic. Look for bread that has visible pieces of grains. There has not been much research, but some preliminary evidence shows sprouted grain bread does not cause rapid, high, spikes in blood sugar the way regular bread does. However, remember that sprouted grains are not entirely fiber—even though some bread labels make the claim. If a brand claims large amounts of fiber and very low "net carbs," read the labels closely. Some bread uses a lot of wheat gluten instead of the whole grain. Since gluten is the protein part of the wheat, this type of bread can be a good choice—unless, of course, you have Celiac disease. While you may be able to include some types of bread on a low-carb diet, other popular varieties are almost always high-carb and high-GI. You may decide to have these types of bread in moderation, but they won't be a staple of your low-carb diet. Nutrition labels for bagels and rolls can be deceptive: they often contain two, three, or even four normal servings of bread. Some brands offer bagel "thins" that have fewer calories and carbs. If you can't find these options, try making them yourself. Using a spoon (or even your fingers) remove the soft centers of a sliced bagel. Hollowing it out before you place schmear or use it for a sandwich will reduce some of its carb load. Soft bread is usually made from white and/or very finely ground flour. Your body quickly breaks this down into sugar, giving bread like challah (which can have 35 grams of carbs per serving) a high glycemic index. While most bread is made with some sugar, try to avoid brands that have added (even hidden) sugar. Check the nutrition label carefully: if one of the five ingredients is sugar, honey, molasses, fructose, or another name for sugar, you'll know that bread isn't the best first choice. Wheat has more protein than most other grains, but alternative grain bread (such as those used in gluten-free options) are usually higher in carbohydrate than bread made with wheat. While there may be some exceptions, you'll want to look at the serving size and nutrition information carefully. Najjar, AM, Parsons, PM, et al. "The acute impact of ingestion of breads of varying composition on blood glucose, insulin and incretins following first and second meals." Human and Clinical Nutrition. Vol. 101, No. 3 391-398 (2009).